The Merced River is one of the defining features of Yosemite National Park. Originating in the high Sierra Nevada, this free-flowing river tumbles into one of America’s most iconic valleys. The Merced first cascades over spectacular Nevada and Vernal Falls, where its crystal-clear waters proceed to meander through the Park’s picturesque valley and past a backdrop of aspens, cottonwoods and evergreens, grassy meadows and dramatic, glacier-carved mountain peaks. Just outside the Park, we are able to launch our rafts and start the fun. The Merced River is a snapshot of a reawakening Yosemite wilderness. With wildflowers covering the steep hillsides, our spring and early-summer season on the river comes fast and furious as we enjoy some of California’s best Class III/IV whitewater. Together with family and friends—both new and old—we spend a memorable day experiencing the excitement of rushing, crashing, crystalline whitewater. During the spring, the Merced features mile after mile of huge wave trains and long staircase drops, delivering nearly non-stop whitewater thrills. However, it is still suitable for aggressive beginners; its intensity is kept somewhat in check by a general lack of obstacles amidst the rapids and by the calm, glassy pools that provide a reprieve between bursts of whitewater. The Merced’s free-flowing waters—dependent solely on snowmelt, without dams or reservoirs in the way—keep its season short and sweet! Rafting season on the Merced River is generally limited from late April to mid-June, depending on the preceding winter’s snowfall. Meet your trip leader and fellow adventurers at 9:00 AM; please be prompt! Once everyone has arrived, we will board our shuttle to the river. At the Indian Flat river put-in point, you will meet the rest of your OARS crew. The guides will deliver an orientation and safety talk then fit you with your safety gear. Exciting and wet, Cranberry Rapid is the first big rapid you encounter and is a great way to start your day. Throughout the afternoon, Class III and IV challenges like Ned’s Gulch and Gauge Hole provide thrills as we continue down the Wild and Scenic Merced River. On warm days, the slower stretches of cool water are great for an invigorating swim. Come lunchtime, we will pull over to a beach for a delicious picnic. Your guides will lay out an abundant spread of cold cuts, cheeses, veggies and breads, or perhaps a tasty taco salad for roll-your-own burritos. Lunch is always accompanied by fruit, cookies, cold water and lemonade. Beyond the alternating clear pools and frothy whitewater, the surrounding scenery is magnificent. Just outside of Yosemite, this picturesque canyon is adorned with pine forests, colorful wildflowers, rocky ledges and sandy beaches. As we reach Railroad Flat, our river trip draws to a close. At the take-out point, an OARS shuttle will be waiting to take us back to the your vehicle. You will generally return to your car sometime before 5:00 PM, depending on water levels and weather conditions. We’ll meet at 9:00 AM. The OARS meeting place is a wide dirt pullout on the west side of 140. Look for our vehicles, and the yellow and blue OARS sign! Click here for a Google map. From the San Francisco Bay Area, take I-580 East to I-205, then east on Hwy 120 to Hwy 99. 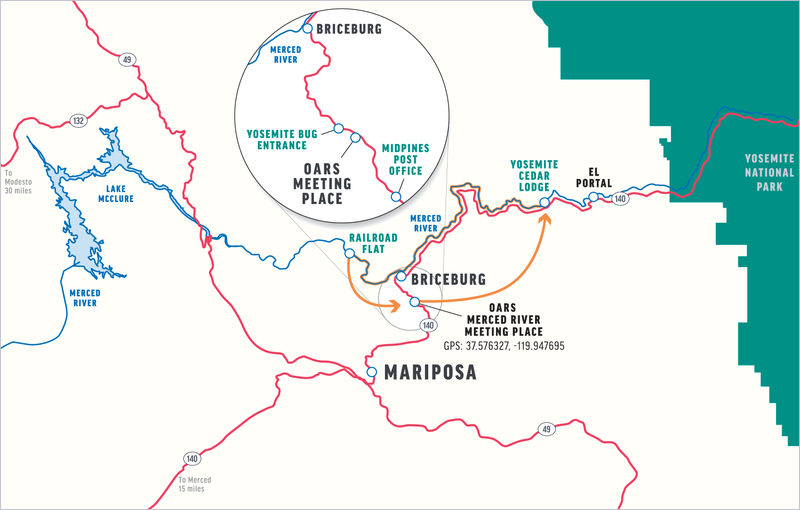 South on Hwy 99 to Merced, then Hwy 140 east through Mariposa. From the intersection of Hwys 49 and 140 in Mariposa, travel for 8.6 miles up 140E and then you will see our meeting place on the left (1.3 miles past the Midpines Post Office). From Yosemite* or El Portal, the OARS meeting place is 22.6 miles (approximately 40 minutes) southwest on Hwy 140 from the Arch Rock Entrance to Yosemite, on the right (or west) side of the highway. Our meeting point is 0.4 miles past the Yosemite Bug Hostel driveway and bus stop. * Check out the Caltrans Quickmap for up to date details on possible delays. These are approximate mileage and driving times and do not take into account any delays. Please allow yourself extra time. We recommend that you make your lodging reservations well in advance. Yosemite and its outlying areas are extremely popular, and lodges fill up quickly. Please mention you are rafting with OARS. You may want to check one week prior to your trip for an up-to-date weather forecast. We recommend you check the following web sites for weather in El Portal, CA: www.weather.com or http://www.accuweather.com. We recommend starting with bathing suit/swim trunks and a lightweight synthetic shirt. For cool weather, add layers of synthetic long underwear and warmer clothes as needed. Our wetsuits do not include “wetsuit booties”–please bring your own, or wear wool socks with tennis shoes as a good alternative. Please let us know if you have any medical issues or dietary restrictions that well need to consider in planning your trip. In reviewing your statement, you will note a $1/person/day donation to Friends of the River, a non-profit conservation organization dedicated to protecting California’s rivers, streams and watersheds. One-hundred percent of these funds go directly to Friends of the River, and your contribution is tax-deductible. See www.friendsoftheriver.org for more information. This donation is voluntary and may be removed from your invoice if you choose not to participate. Please notify our office to delete the donation from your balance.